CITIGROUP, the international financial behemoth, has a complex history encompassing many banks. In fact, its website, citigroup.com, says, “Our history dates back to the founding (in the United States) of Citibank (in the beginning, the City Bank of New York) in 1812, Bank Handlowy in 1870, Smith Barney in 1873, Banamex in 1884, and Salomon Brothers in 1910”! Citibank’s presence in Malaysia is a little younger, having begun two years after our independence in 1957 from British colonial rule. The First National Citi Bank at Medan Pasar, Kuala Lumpur. 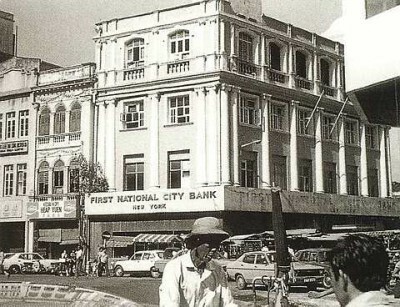 1959: The First National City Bank opens in Kuala Lumpur’s Medan Pasar with 17 employees. 1965: Citibank opens its first branch, in nearby Jalan Ampang. Its first branch in another state opens in Penang to cater to the growing number of customers on the island. 1982: The bank’s Global Consumer Banking service is launched in Malaysia. 1985: Fast approval for housing loans become a reality for the first time in Malaysia when Citibank launches the three-day approval period. 1986: Citigold, Malaysia’s first priority banking service, is introduced. 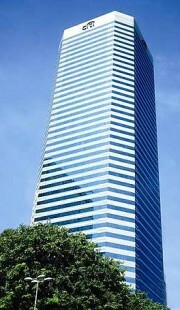 The bank’s current, shiny headquarters, Menara Citibank, still on Jalan Ampang, KL. 1987: Phone banking becomes available through CitiPhone. 1989: We see the first Citibank credit card. 1994: A major milestone is achieved when Citibank Bhd is incorporated. Citibank Malaysia (L) Ltd, an offshore banking entity, also opens in Labuan. 1995: CitiBusiness for small and medium enterprises is launched. 1996: The country’s first centralised service centre for corporate customers is launched with CitiService. 1999: Evergreen Reward Points are introduced for credit card holders. 2000: Citibank Johor opens. The Blue credit card is introduced to the youth market, where it finds much favour. 2001: Online Banking is launched. The bank relocates its entire Kuala Lumpur operations and businesses to its current location, Menara Citibank on Jalan Ampang. It also becomes the first foreign bank to launch CitiDirect (a securities service platform) for corporate customers. 2002: The first cash deposit machine is introduced, opening up after hours banking for customers. The bank also launches its one-hour card replacement service for lost credit cards. 2003: Malaysians are introduced to the concept of the FlexiHome Loan. 2004: We see the first cash back credit card and the Citibank Clear Visa Mini card. 2005: Citibank becomes the first foreign bank to offer the Giro service, a method of electronically instructing a bank to transfer money directly to another bank. 2006: There’s a mini explosion of branches being opened when certain restrictions on foreign banks are lifted; Citibank opens four at Bukit Tengah (Penang), Damansara Perdana (Petaling Jaya), Klang, and Puchong (Selangor). This is also the year the bank joins the fast-expanding Islamic banking market by launching Murabahah Deposit–i. 2007: Mobile phones get into banking through Citibank’s Mobile Bill Payment and the Citibank World Privileges on Mobile services. The bank also begins its own property portal this year. 2008: Citigold Global Banking and EPF e–contribution services and EPF Smart Kiosks are launched. 2009: Despite the economic downturn that began in 2008 and the closing of selected Citigroup branches around the world, globally, the group reports second quarter revenue of US$30bil (RM106bil), up US$12.4bil (RM44bil) from the second quarter of 2008. The future: Citibank has plans to set up four new branches by 2010, and to apply for an Islamic subsidiary. After half century, it is no longer the only international bank in the country, but it has certainly held up well to competition.